Montana Cans just released the limited BLACK Artist Edition cans with your designs. Are you happy with the result of your work? MINA & BRUCE: Yes, we are very happy with the outcome of the cans! Maybe the both of you could introduce yourself shortly – where do you come from and where do you live / work currently? BRUCE: I’m originally from Paris. I lived in Berlin, Germany for about 5 years and I currently live and work in Belgium. MINA: My studio base is in Munich at the moment. I am travelling a lot and living from time to time in different places. Like Berlin, Amsterdam, Paris. Your roots are within classic Graffiti writing. What did Graffiti mean to you in the past and what’s the value nowadays for the development of your art? MINA: Yes, our roots are within classic graffiti writing, which is still very important to us now as it was in the past. For me both within my life and my artistic work. My studio work is inspired by the formal language of my graffiti, but in an abstract way. The energy I feel when I’m painting outdoors is a constant motor and motivator for my studio work. When did you start writing Graffiti? Who did you influence at that time? BRUCE: I started painting graffiti in the mid- nineties when I was a teenager. I recall I was about 15 years old. I used to look at a lot of graffiti pieces around the city. Once, I found that an older guy from my school was the person painting them. I started talking to him and asked if it was possible to pant with him and how? That’s how it all started. Your paintings are shown in galleries and exhibitions. Do you feel more related to the streets or in an official context? MINA: I have to admit, I love both. When did you meet Mina for the first time? BRUCE: I met Mina 8 years ago in Paris during an opening event. We got to talking and decided to go painting the day after. What does it mean to you to be printed on a limited edition Montana spray can? MINA: It is a honour for our work to be featured on a limited edition Montana BLACK spray can. At the same time it means an appreciation of our work and a recognition of us as artists. And for me personally also my contribution to the graffiti culture. You did an Artist Edition of Montana BLACK – which color did you pick and why? BRUCE: I chose the ICE BLUE color, I like pastel colors and it reminds me of Berlin winters. MINA: I chose the color “Olymp”, because the mint shade is fresh and one of my favourite high covering colors. Tell us something about your work. BRUCE: I started by painting walls, then quickly switched to trains for many years. After a while, I went back to doing walls. I started doing more bombing in the streets because for me, it’s more interesting. I like walking in the streets, painting easy and quick throw-ups. I don’t want to spend too long in front of one wall. Sometimes I will add eyes, hands or feet which makes kind of a mix between a throw-up and a character. But the main focus and the most important thing for me is doing short, quick pieces. This I like the most. How would you describe the subject of your designs with your own words? MINA: My design represents the goddess Athena, the most famous greek goddess and one of the twelve olympic deities. She is the goddess of art, wisdom, strategy and war. Not to mention the goddess and namesake of the Greek city of Athens. What does Graffiti mean for you? BRUCE: To me graffiti is a kind of freedom. It’s real freedom. You paint for yourself and for your friends, wherever and whenever you want. It’s also a kind of sport. Some people play football, I like to do graffiti. What’s the importance of spray cans for your paintings and why did you choose to work with lacquer? 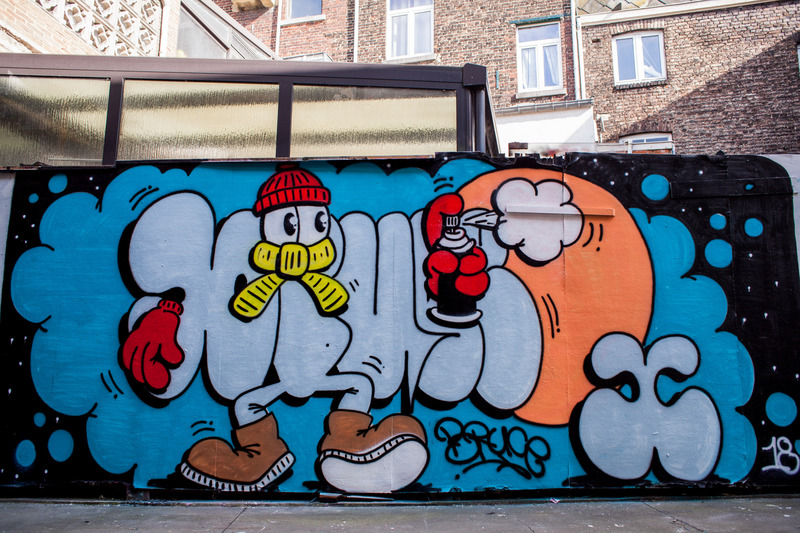 MINA: Spray cans are my tool of choice and my preferred material to paint outdoors. What do you like about Montana BLACK? BRUCE: You don’t lose any time when you paint. The pressure is high and the coverage is great. That’s perfect for me. If you could pick any spot to paint with your BLACK Artist Edition, where would it be and what would you paint? 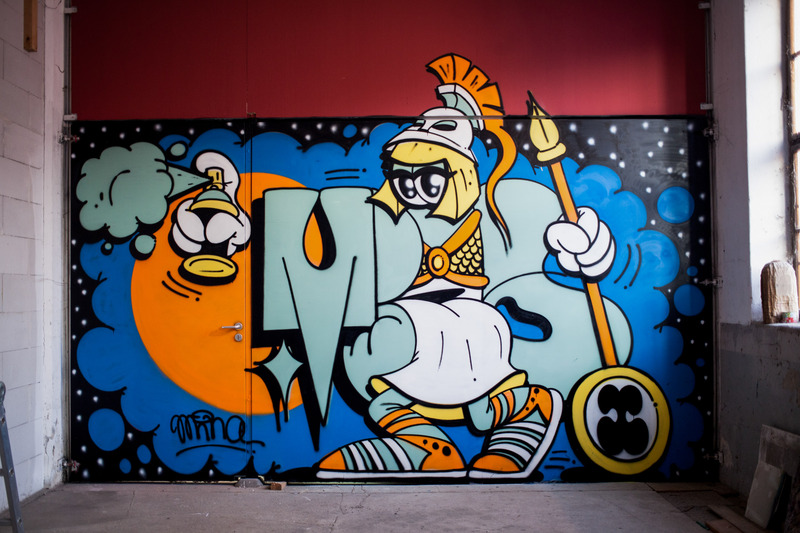 MINA: I would love to paint the Mina Athena in Athens. MINA & BRUCE: Keep on going, never give up! Thanks guys for the interview!